Spinergy Everyday Light Extreme 24"
Spinergy Everyday Light Extreme 26"
Spinergy Everyday Light Extreme 25"
Improved under-chair hand access with only 12 spokes. New spoke design is extremely durable. Very quiet rolling wheels (no spoke creaking). Ultra lightweight and attractive design. Minimal maintenance required. The use of PBO spokes reduces the weight by 100+ grams over traditional wire spoked wheels. When combined with Spinergy's ultra-light hub and rim technology, a wheel with superior handling characteristics results. Less weight and PBO spokes means lower moment of inertia. For the user, that means quicker acceleration and lower rotating weight. Braking effectiveness is also increased due to lower wheel inertia, allowing riders to brake further into corners with less effort. The PBO wheel can withstand impacts 25% greater than a traditional wire wheel and 50% more than comparable high-end products. Rim strength is not sacrificed for weight savings. You rely on your wheels to get you to the finish, time after time and Spinergy delivers. Spinergy's impact fatigue tests show that a PBO spoked wheel is designed to be more resistant to repeated impacts than any other wire wheel design. PBO wheels will need much less truing and maintenance than other wheel designs. The resilient damping qualities of the PBO fiber spoke absorb more road shock then a conventional wire spoked wheel. You will feel the difference your first ride. Spinergy guarantees that broken spokes are a thing of the past with PBO fiber spokes. 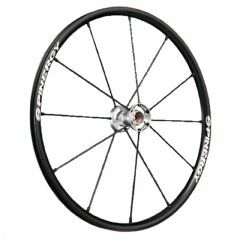 If you should break a spoke on any Spinergy PBO wheel during the first 2 years of ownership, Spinergy will replace it for free. This does not include broken spokes during contact sports or activities. The PBO fiber strands are encased in a chemical resistant, water / UV proof composite offered in a variety of colors. The outcome is a flexible spoke with incredible strength that will absorb impact more efficiently while staying in true. Spinergy's patented PBO spokes are lighter than traditional steel spokes which results in less rotational weight and a faster responding wheel – giving you the ultimate edge. All this delivers a wheel that is lighter, stronger, faster and superior in every way.